Mint leaves add a nice refreshing flavor to any drink or salads. During summers, I add them in chaas, juices, soups or as garnish for salads and was thinking how it would taste if I add them to yogurt based kadhis. 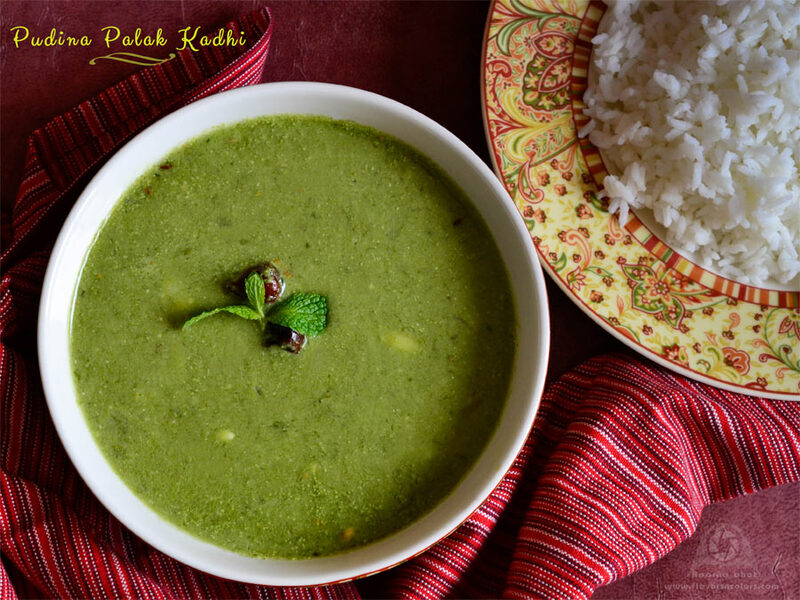 So this time when I lay my hands on fresh mint leaves, I added handful of them to below palak kadhi recipe. It surely took this kadhi to another level and tasted super with fresh and aromatic flavor. Read below to find out how I prepared it from palak and pudina. Wash together buttermilk with besan and make a smooth mixture, Just before adding it to the pan add salt to this mixture. Wash and clean palak, pudina leaves. Roughly chop them. Grind it with chopped garlic cloves, small piece of ginger, 1 tsp cumin seeds, chopped green chilli into a smooth paste. Now heat ghee in a pan. Add cumin seeds and when they crackle, add red chillies and stir it. Once they turn bright red add crushed garlic and chopped onions. Saute them till they turn golden brown. Now add the pudina palak pureed paste and saute it for a min. Add pinch of turmeric powder, buttermilk gramflour mixture, sugar and cook it on low heat stirring continuously till kadhi thickens. If you prefer thin consistency adjust it by adding water as required. Garnish with fresh pudina leaves and serve it hot with steamed rice. nice kadhi. going to try this as soon as I get some pudina..